Bitcoin’s wild ride of late has drawn the attention of regulators and the scorn of titans of finance, ranging from Blankfein to Jaimie Dimon to Warren Buffett. We who are in the more civilized equity business take comfort in the fact that our product is “real wealth,” our trading is regulated, and nutball price swings are rare. 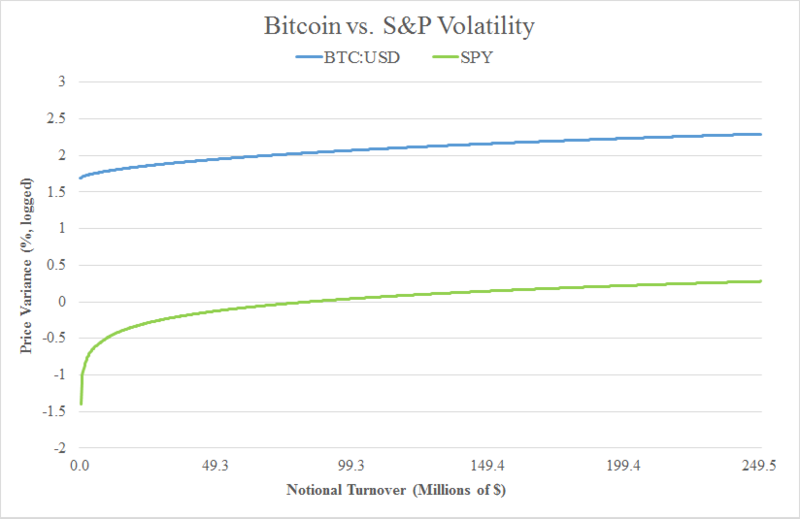 Compare bitcoin to an equity product like the S&P 500 ETF—symbol SPY. The graphic below shows notional turnover on the horizontal axis and price variance—a statistic related to volatility—on the vertical. As we can see, turnover and volatility move together. (The price variance in the chart has been logged to make it more readable, but the underlying data are in basis points—bps.) So when SPY turnover is $250m, for example, price variance averages 1.9 bps. For the equivalent turnover in bitcoin, in contrast, the price variance is over 100 times higher—195 bps. That’s enough volatility to deter a lot of investors. Yet bitcoin-level price swings are not as rare in the stock market as you may think. SPY is far from representative. As a major hedge fund chief investment officer put it recently, trading small caps can be like “sticking your hand in a fan to see if it’s running.” You may get your trade done, but you’re likely to be bloodied. How so? Take a small cap company like Fonar, a medical equipment provider—stock symbol FONR. 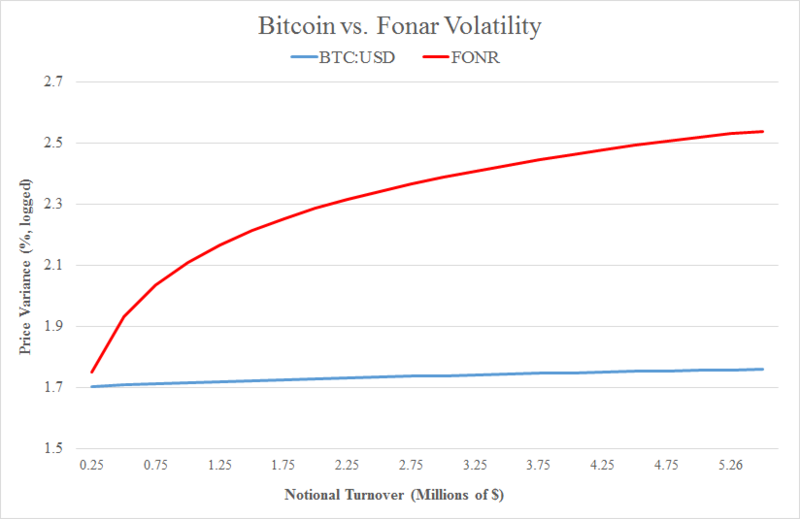 FONR trades far less than SPY or bitcoin. $5m in notional turnover in a single day is on the high end of normal for the stock. And at that level, as we see in the graphic below, price variance, at 346 bps, is not only way beyond what we see for SPY, at 0.5 bps, but way beyond what we see for bitcoin! Bitcoin price variance is a mere 53 bps at the $5m turnover level. What this example shows is that small cap traders can do far better for themselves and their clients by changing the way they trade the product. Most are relying on continuous markets, where a buyer missing a seller by seconds can result in opportunity costs that noticeably harm investment returns. But there is no reason to rely on inapt and outdated market structure when computer technology is so vastly superior to what it was even a few years ago. Today, stocks can be traded in automated on-demand auctions—auctions that summon latent liquidity to execute small cap trades with no information leakage and far less market impact. Whereas continuous markets fragment liquidity through time, auction markets aggregate it—tamping volatility and making better prices for investors. Using cutting-edge computer technology, we at CODA Markets are able to run thousands of successful auctions each day, executing small cap trades at prices that would be difficult or impossible to achieve in continuous markets. So why suffer the sort of price-swing whiplash that makes bitcoin look stable? The remedy is clear: use auctions.